Sharpe's grysbok is a slight antelope that counts amongst the rarest of sightings on safari. 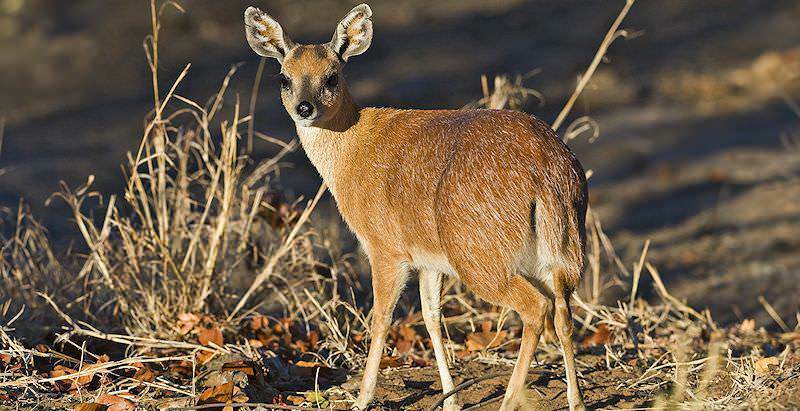 The Sharpe’s Grysbok is another species of dwarf antelope and belongs to the same family as the Steenbok. It has a lightly grey shaded face and a dark red-brown fur color that covers its body, with a grey overtone formed by the top layer of hair with its contrasting grey color. This grey or silver color fur is considerably longer over the hind part of its body towards its rump and the rear end of its body. Their average sizes range between 7 and 11,5kg in weight, similar to most duiker species, and other small antelopes such as Oribis, Steenboks and also Klipspringers respectively. The Sharpe’s Grysbok’s distribution range starts around parts of Tanzania just south of the great Lake Victoria, along Tanzania’s borders with its sister country of Kenya. From there they are spread through the tropical and dense country of Mozambique, Malawi, Eastern parts of Zambia and Eastern Zimbabwe right down to the neighborhood of the Kruger National Park, the northern parts of South Africa in the Limpopo forest. These small horned beasts are however absent along the edges of Mozambique and Tanzania along the coastal areas so famous for their warm oceans and beautiful beaches. Sharpe’s Grysboks are fairly widespread throughout the south eastern parts of Africa, north of the tropic of Capricorn and aren’t threatened currently, despite many developments in countries like Mozambique and Tanzania. They have quite a high population density, with an average of 3 or so animals on every square kilometer of land within their range. Populations of these dwarf antelope vary from region to region, but their total population exceeds 95 000 individuals, of which most are not within national parks or other protected regions. For this reason, the Kruger National Park is one of the only sanctuaries in which they can be found within South Africa. Most small creatures, such as the Sharpe’s Grysbok, need some form of cover in the habitat they live in, whether it be medium sized grass, or denser shrub areas. They make use of this denser vegetation mostly as shelter, to shield their newly born young, to hide from predators themselves and to get away from it all in the hot midday or late in the deep hours of the night. Miombo woodland areas in Zambia and Zimbabwe, sub-tropical areas of Mozambique and Swaziland and woodland areas in the Kruger and in the parts of Tanzania which they reside in all form the main types of habitats within their range which they inhabit. Sharpe’s Grysboks are very territorial creatures, like most antelope that do not form herds of individuals that live together as one community in a home range in which they forage and spend the majority of their time. They are however less ritualistic and traditional in the way in which they battle and settle disputes over territory, and rather go for the good old-fashioned method of going on their knees and using their sharp, pointed horns to fight. Territory sizes vary but are around 0,34 square kilometers on average when looking at their average population density of 3 individuals for every square kilometer. Like duikers in some areas, the Sharpe’s Grysbok is almost solely a nocturnal wonderer and forager, spending the remainder of their day resting in the thickets in which they rest during the hottest hours of the day. They are also solitary, but pairs share territories and mark their territory together by spreading feces and urine along the edges of their property. Their offspring live on the same piece of land until they are independent. This means getting or fighting for territory of their own in the case of male young or finding a mate with his own territory in the case of female young. These animals are able to breed annually and breed any time during the course of the year, although births usually peak at the start of the rainy season. Their courtship involves much of the same activities and movements as their more widely spread family members the steenboks, with leg lifting and rubbing on the itinerary of both species prior to mating. Both males and females reach a sexually mature stage of their lives around 6 to 19 months of age, varying greatly from region to region. The gestation of period of a fertilized female Sharpe’s Grysbok is between 5.6 and 7 months, after which litter of between 1 and 2 offspring is born. When in danger, the first reaction of these animals is to hide from the predators that put them there. The same thickets that they hide their new-born young in are where they find an asylum from threats to their life. They usually crouch to the ground or hide in abandoned borrows made by aardvarks or other mammals when predators are in the vicinity, only running or fleeing the scene when predators come very close, as a very last resort. When they choose to run, they stay as close to the ground as possible and run into other areas of denser vegetation to get rid of the predator on their tail. South Africa's top destinations are Cape Town and the Kruger Park. Travel to Botswana for diverse game viewing activities, like sunset cruises. Namibia travel consists of exhilarating desert adventures & prolific game viewing. Zambia is a wild country with remote safari areas like South Luangwa. Mozambique is the top beach vacation destination on the continent. The Greater Kruger National Park is a sprawling two million hectare wilderness in the northeastern corner of South Africa. The Sabi Sand Private Game Reserve is a wild utopia preserving extraordinary diversity within its exclusive 65 000 hectare wilderness. The city of Cape Town is one of the most beloved and sought-after travel destinations on the African continent. The Garden Route is an alluring honeymoon and family vacation destination in South Africa's Southern Cape.